AMCARE develops regenerative therapies which aim to circumvent some of the limitations of current treatments for MI patients. Our rationale is to use biomaterials to deliver cells or growth factors to the heart. Biomaterials are materials in which cells can be encapsulated or attached, can support delivered cell growth and which are tolerated by the body. In this way, delivered therapeutics are retained within the heart tissue for extended periods. In addition, biomaterials provide a protective environment for delivered stem cells and enhance stem cell survival in the harsh conditions of the infarct. 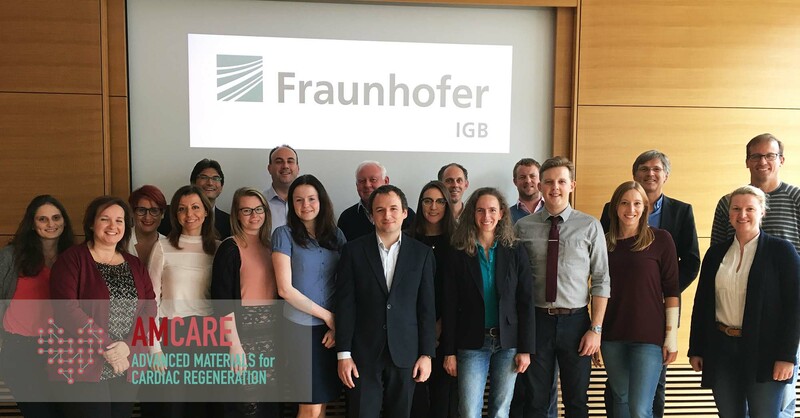 By combining regenerative stem cells and growth factors within the same biomaterial, our aim is to maximise regeneration in the heart thanks to the synergistic effects of both therapeutics. 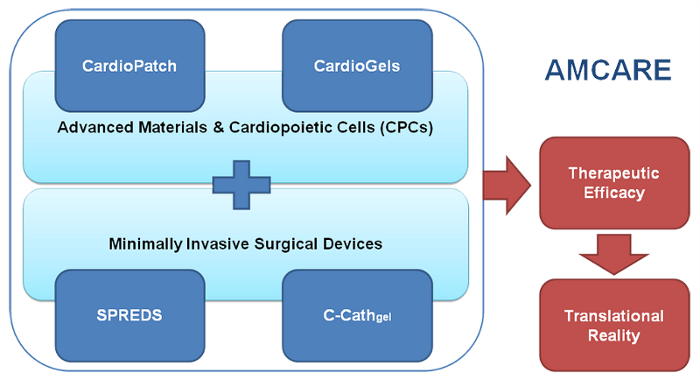 AMCARE investigates two major biomaterial delivery approaches – injectable hydrogels and epicardial patches. 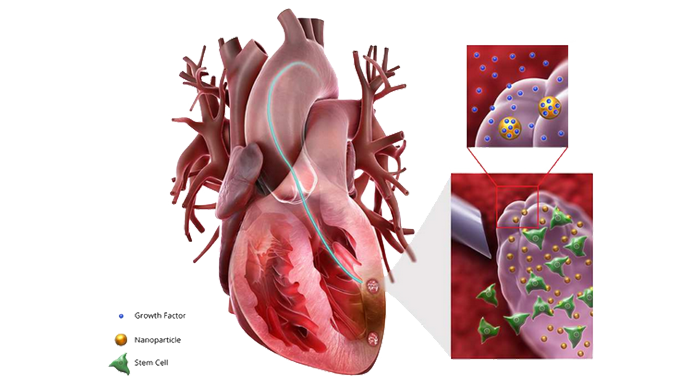 Injectable hydrogels are viscous gels which can be injected into the heart wall. Often such gels can undergo a chemical change once in the heart tissue, whereby they become more solid, helping to retain encapsulated cells and growth factors. Epicardial patches are fibrous sheets which can be attached to the outside surface of the heart, known as the epicardium. From there cells or growth factors in the patch can migrate into the underlying tissue to produce therapeutic effects. Both epicardial patches and injectable hydrogels provide a protective and retentive environment for cells and facilitate a slow release of growth factors, so that therapeutic effects can be produced for a long time. 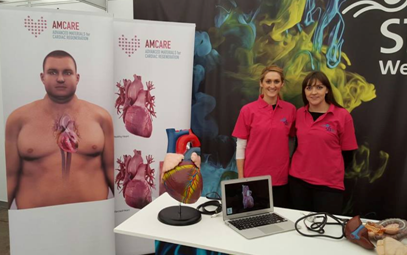 Finally, AMCARE develops innovative medical devices (Transarterial catheters and deployment systems for Epicardial patches) to deliver biomaterials in a minimally invasive way, using custom to access the heart while minimising patient morbidity. Transarterial catheters are medical devices which consist of flexible, hollow tubing with an ‘active’ tip, which can inject hydrogels. The device can be passed into the blood vessels through a small incision, typically in the groin, advanced and manipulated by a surgeon by a handle, until the tip reaches the heart wall. Such an approach is much less invasive than traditional open heart surgery. Currently, such catheters have been utilised to perform injections of cells in salt solutions into the heart wall. In AMCARE we design new catheters which can inject viscous hydrogels into the heart wall, from the inside of the heart chamber. deployment systems for Epicardial patches can deploy and attach a patch to the heart surface, in a minimally invasive way through a small incision between two ribs, without the need for open heart surgery.